Want to feel like you're in an exotic locale without having to actually get on a plane and fly eight-plus hours to get there? Simple. Slip into some of this season's coolest tropical-print clothing, and you'll instantly feel like you're on a beach getaway because nothing says "I'm ready for some fun in the sun" more than colorfully printed attire. Ahead we've scoured the internet to put together an edit of the absolute coolest (and of course, fresh and fun) palm- and floral-emblazoned pieces currently available online. 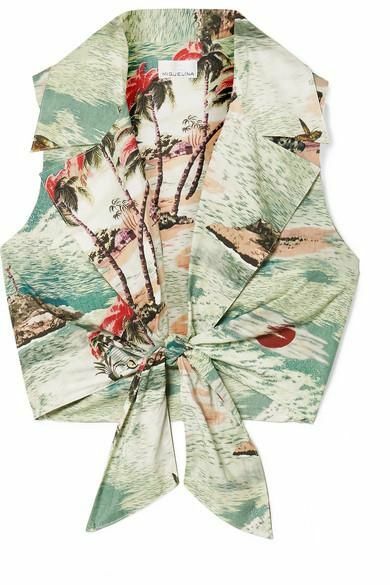 From the perfect pair of patterned wide-leg pants to the prettiest silk dress that would look so cool styled with a pair of white sneakers, these are the tropical-print pieces everyone will wear this summer—trust us. Available in sizes 0 and 4. Available in sizes FR36 to FR44. Available in size 0 to 12. Available in size 24 to 36. Available in size 2 to 14. Next up, add to your collection of palm- and floral-emblazoned pieces by shopping our favorite tropical-print swimsuits.